Alex Carlson’s 1937 Ford Deluxe Tudor Sedan, which Mick Felder repaired after an accident. My story with Mick Felder begins many years ago when I purchased my first car at the age of 13 with the help of my grandfather. In 2009, I was presented with the opportunity to purchase a 1937 Ford Deluxe Tudor Sedan that belonged to Rick Houten, who was known locally for his automotive dent removal business. He was a friend’s neighbor in El Segundo and had passed away. The 1937 Ford was his primary mode of transportation. After Rick acquired the car sometime in the early 2000s he had taken the car to Mick to have all four fenders repainted. Once I ended up with the car and found out Mick knew a lot about the car’s history, my grandfather and I decide to pay him a visit. I am a Hermosa resident myself so visiting Mick could not have been any more convenient. When Mick saw us pull into his parking lot with the Ford he came outside immediately and the first words out of his mouth were, “Oh my god, that’s Rick’s car. How did you end up with that?” We spoke for quite some time about Rick and the car and became immediate friends. Over the years we bonded over early hot rod history, which he was involved in during it’s developing post war years. For my 14th birthday, a large group of us met at Micks shop on a Friday to caravan down to Ruby’s Diner car show. Mick drove his 1917 Studebaker. 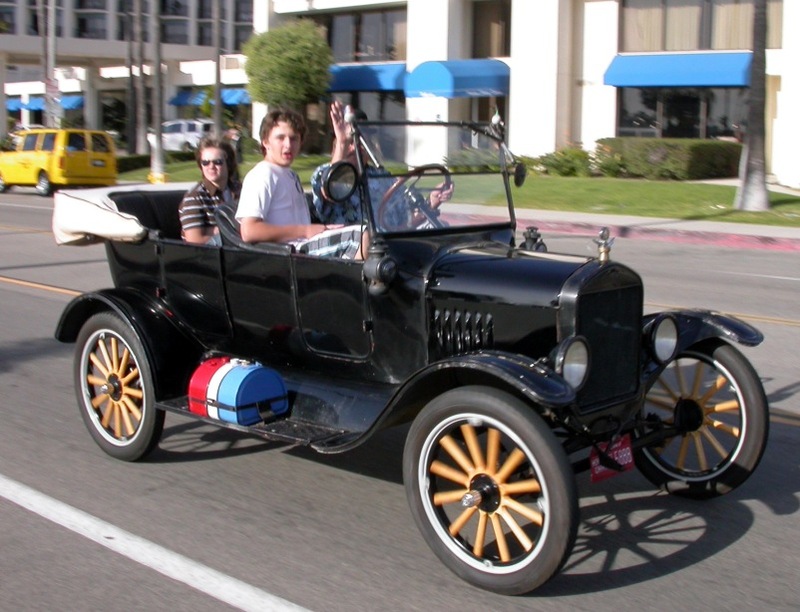 Alex Carlson on his 14th birthday in 2009, riding shotgun behind Mick Felder, who led the birthday party caravan to the Friday night auto show at Ruby’s in his 1917 Studebaker. 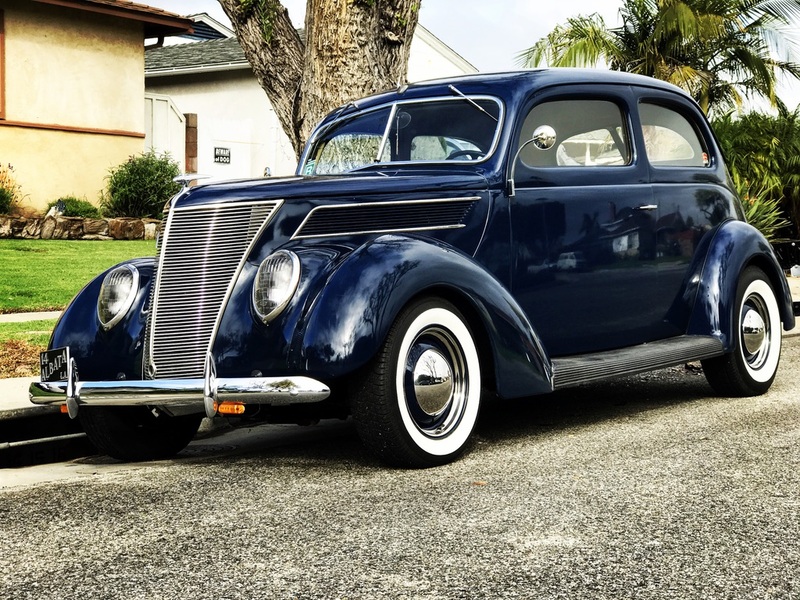 Though my 1937 Ford was my only car when I was at Mira Costa High School, I was always a bit nervous about driving it to school and parking it in the student parking lot. The car spent the majority of its time in my grandfather’s garage. One day after school I noticed the passenger side rear fender was smashed in. I nearly had a heart attack on the spot, at age 16. Come to find out my grandfather decided to take the car to lunch that day and backed it into a wall. Upsetting as it was, we knew this would be an easy repair for Mick. A few days later we took the car down to his shop. Mick told us the color of the car was a factory original “Washington Blue.”. About a week later we got the call from Mick to take the car home. When we got to the shop the car was still parked inside his garage. Mick backed the car out so we could see his work in the sun and we were ecstatic over how beautiful it looked. Then Mick got out of the car and looked at it to make sure he was satisfied. Though my grandfather and I were very pleased, he was wasn’t. Apparently, Washington Blue, depending on when in the year of 1937 the car was built, could have been painted using one of three base colors — green, blue, or grey. Mick eyeballed the fender and said the color mix needed just a tad more white and told me to come back in a couple more days. I could not tell that anything was off but I had faith that the master craftsman knew what he was talking about. When we came back for the final inspection and to pick up the car, it was just as beautiful as before but I was pleased to know that in spite of my untrained eye, the car was perfect. Mick told me that the fender hadn’t even been removed from the car to make the repair. He managed to massage the metal back into place right on the car. From there, he was able to paint just the damaged area. He was so talented with color matching by eye alone he did not see it necessary to paint the entire fender. To this day I would defy anyone to notice any work done to that fender unless I told them. The last bit of work I had done by Mick was on my latest project, a 1932 Ford Roadster. I knew he would be the best man to straighten out a bend in the frame . Within two days the frame was as straight as an arrow. Mick will be greatly missed in the car community. He leaves behind a legacy of craftsmanship and friendship that cannot be replaced.